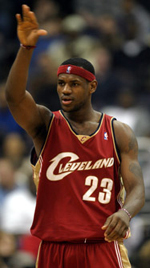 Yep, the rumors you've heard are correct: LeBron James is turning 21 years old tomorrow. Let's put aside for a moment that James is a serious MVP candidate, one of the most powerful and influential athletes in the world and, if you can judge by his new commercials, a much better actor than Shaq. Let's think instead of your 21st birthday. Ours was spent in a bar in Champaign, Illinois, doing 18 1/2 shots of Prairie Fire shots — half tequila, half Tabasco sauce — in the span of two hours. (The 1/2 shot was the one we spilled and sucked off the table.) LeBron James is more powerful and more skilled in his field than anyone you will ever know. And he's 21 tomorrow. Just kind of freaked us out a little bit.